The research field around contract cheating has begun to move so quickly that it is difficult for new people joining the field to stay up to date. The Beyond Contract Cheating presentation, which I delivered as part of a seminar at the University of St Andrews, aims to put the latest UK and international guidance into context. At the same time, it is also introduces the idea of working with students to generate a positive culture of academic integrity. You can find the slides used in the presentation archived on my SlideShare account. There are also many other contract cheating slide decks there. The presentations slides are also embedded below. 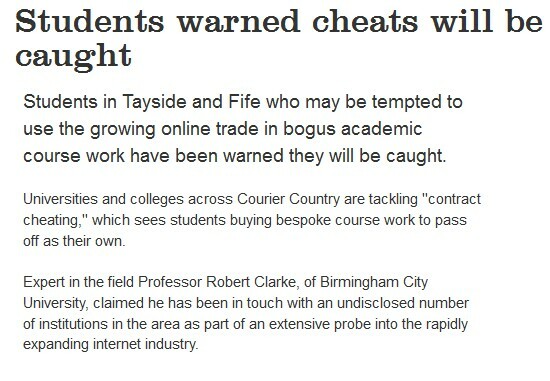 The Scottish Publication, the Courier, has reported on the trade in contract cheating across Fife and Tayside. The report is interesting, as quotes are given from universities including St. Andrews, Abertay and Dundee, none of whom seem to believe that contract cheating is much of a problem. The quotes also show that universities are confusing contract cheating plagiarism. They infer that electronic detection systems are used to detect cheating. However, there are not yet any electronic systems which will successfully detect contract cheating. By its very nature, contract cheating represents original work that has been produced to order. There have been two instances of sufficient seriousness during the last three years to be considered by our Academic Dishonesty Committee. Neither of these instances related to ‘contract cheating’. Such a low rate of detection of what the article refers to as “written to order essays” is worrying. This suggests that more needs to be done across the sector to address the perceptions that universities have about contract cheating and the ways that this academic integrity issue can be prevented and detected.